When I first pulled into Discovery Cove at SeaWorld Orlando, I found it to be unexpectedly tropical and the parking area smaller than what I was used to with other Orlando theme parks. Great landscaping and foliage really set the mood for my adventure. Operating hours are typically 830am-530pm and breakfast, lunch, snacks and beverages are included with admission. The number of guests is limited, and the ambiance made me feel like I was on an Caribbean island retreat. 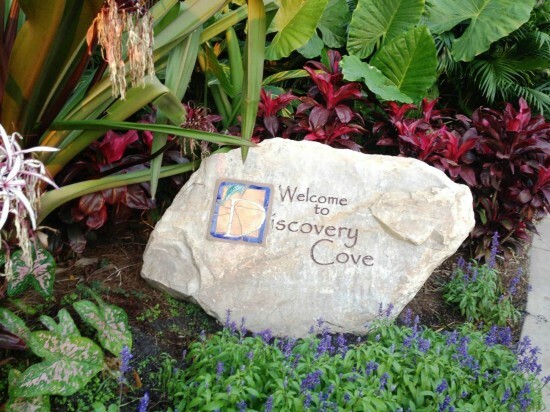 Discovery Cove at SeaWorld Orlando. The first step is checking in (starting as early as 730am). I was assigned a time for my dolphin encounter and got a lanyard with my picture, group number, dolphin interaction time, and 21 and over designation for access to the beer and mixed drinks included in the day. Next step was breakfast. On the way there SeaWorld provides an opportunity for a complimentary group photograph. If you are in a group of friends, they will print a copy for each one of you without any extra charge. The breakfast was buffet style-eggs, sausage, potatoes, French toast sticks, oatmeal, pastries, orange juice, coffee, hot chocolate, croissants, cereal, yogurt. Plenty of choices for everyone. After breakfast it was time to get wet suits with the assistance of an attendant, and our locker was assigned for the day. Snorkel gear and eco safe sunscreen is also provided. 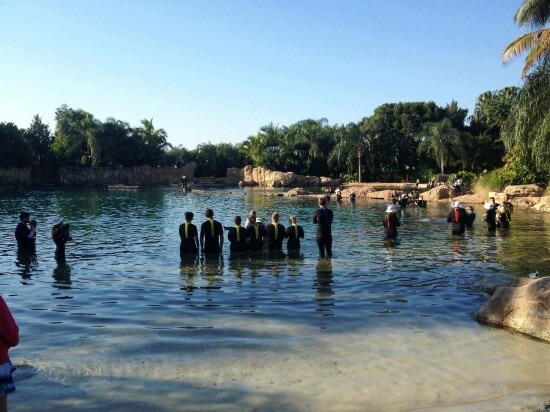 The water is heated except for the Grand Reef and Dolphin areas, where you do need the wet suits — especially if you go during cooler weather. Now it was time to explore the park! There are three different dolphin interaction areas where guests can watch the dolphin experience with the other groups. This is good if you want to get a feel for it before your own time in the water. You also have the option to spend the day at Discovery Cove without including the dolphin interaction, so this would be a way where you can still watch them and take pictures but not interact in the water with them. 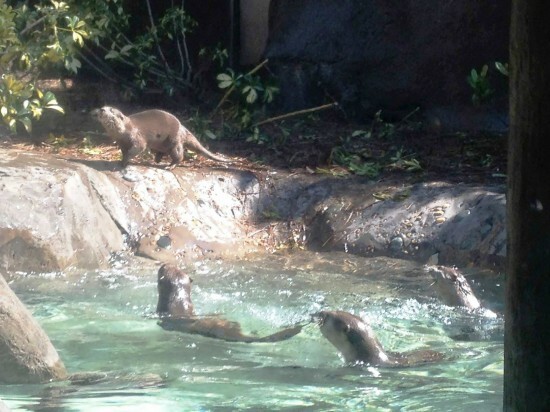 The Freshwater Oasis section has fun Otter and Marmoset viewing areas. The otters are especially entertaining to watch. Guest can get in the water next to them, separated by a glass wall, and there is an attendant in the water with you to answer any questions. It feels a little like you were swimming along and stumbled upon a group of otters having fun and stayed to watch for a bit along your island journey. There is also a large aviary area where guests can feed birds. This area is accessible walking, but it’s also fun to arrive at the aviary while you are floating through the lazy river. I enjoyed getting out of the water, watching and feeding some birds, and then continuing on my adventure in the lazy river — swimming under waterfalls and enjoying tropical views. 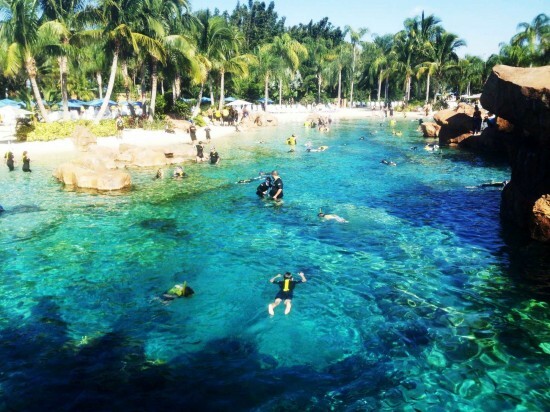 The Grand Reef area is the main snorkeling area where guests can swim with many sting rays (sans stinging barb), colorful tropical fish and other sea creatures. 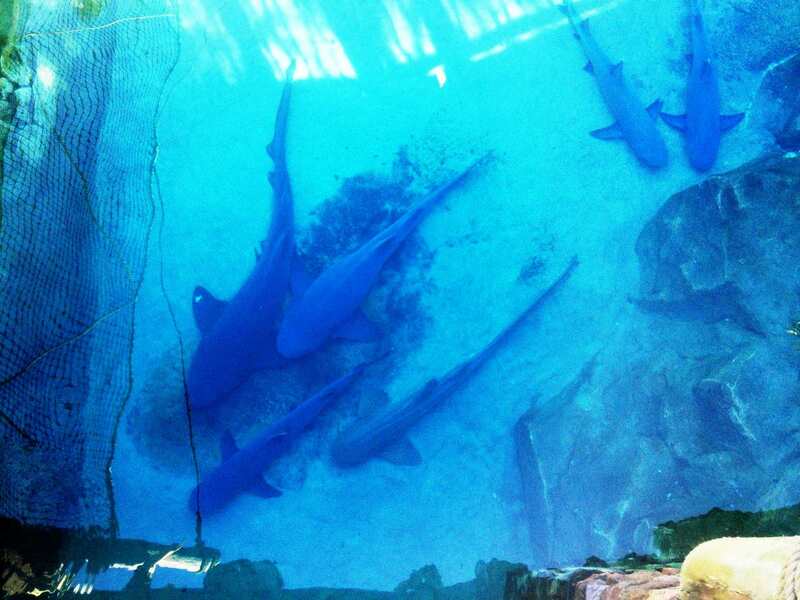 It also has an area where we have the chance to swim right next to sharks! There is a glass wall for protection, but it’s still exciting as the glass wall seems to disappear when I viewed it underwater. Throughout the day, when we were hungry, we really enjoyed the included beverages and snacks at locations throughout the park. For lunch there is also a buffet with a good selection of sandwiches, hamburgers, pasta, fish, fries and desserts. I’d recommend that you plan your day as to when you will have lunch so that you can enjoy all the park has to offer. My highlight was getting to learn a little about dolphins while standing right next to one. It was extraordinary feeling how fast and powerful dolphins are by getting a ride holding on to a fin! Our dolphin was Lester, one of the dolphins that used to perform at the SeaWorld park. 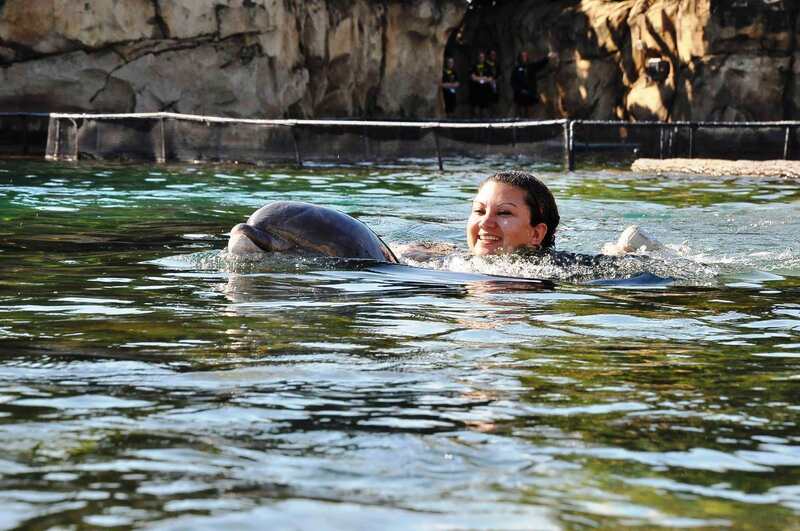 If you are not a strong swimmer, you can also get the dolphin ride in shallower water, which is a great option so that no one is left out. Feeding Lester some tasty fish was also fun. The trainer answered all the questions I had and gave me instructions on where to touch the dolphin and how to get a hug in and even a smooch for the photo ops. 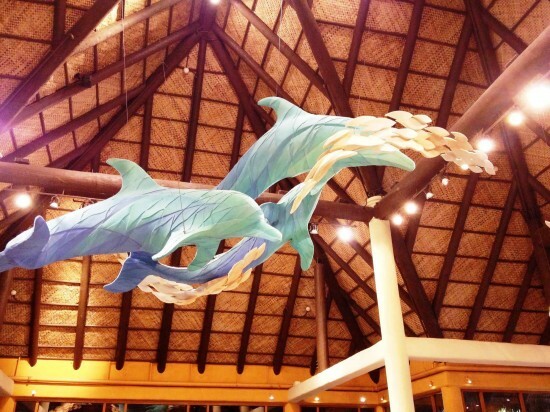 Guests cannot bring their own cameras into the dolphin areas, so if you want these pictures you will have to purchase one of the photo options. 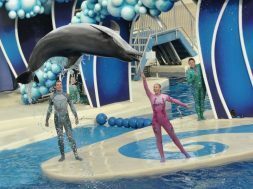 They do have a CD option which includes all the photos of your dolphin experience plus as many photos as you want to add by asking the roaming photographers to snap your pictures throughout the day. Another highlight is seeing the dolphins jump in the air from the water right next to you. The interaction is about thirty minutes and guests are with a group of about eight people per dolphin. Another nice feature of Discovery Cove is that you can shower and change before leaving the park. They include all that you need to make yourself presentable after a day in the water, and you can leave refreshed and ready for your evening. I would definitely recommend Discovery Cove for a day! The limited number of guests and included amenities make it worth your vacation dollar. Look for special Florida resident deals and SeaWorld annual pass holder deals, especially in the cooler months that make it even more of a value. How much is the photo cd? Just trying to budget in how much to bring.